The Yiddish-speaking chefs from the Forverts, the Yiddish-language version of The Jewish Daily Forward, are back for the holiday season with a couple of recipes that could make it easy to prepare a pre-Yom Kippur fast meal or one of the meals for the week-long holiday of Sukkot, which starts next Wednesday evening. The ladies, Rukhl Schaechter and Eve Jochnowitz, chatter and make small talk in Yiddish while preparing Chicken Fricassee and a vegetarian dish of rice with apples. We've run most of their cooking episodes since they started the series in May 2010. To see the other episodes, just type Yiddish cooking in the search box in the left column of this web site. One of the kicks we get out of the series is the painless Yiddish lesson that comes from listening to their banter as the English translation appears in subtitles. For example, gehakte knobbel has much more character than minced garlic, and hoit is much more expressive than chicken skin. 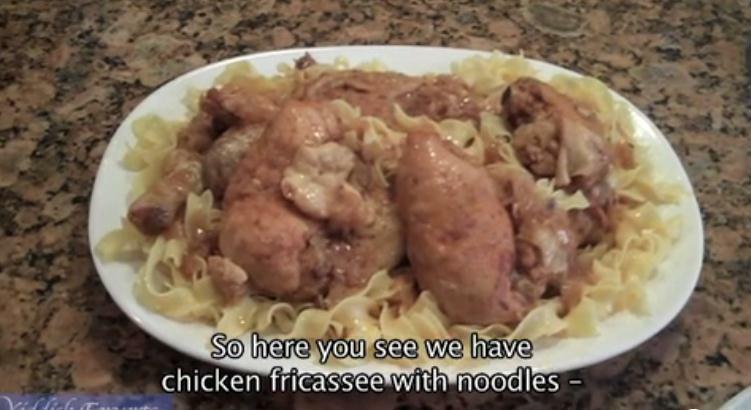 The recipes in this series, including this one, are not what you'd find in a fancy fusion restaurant, but they do offer a look back at the life of Jews in Eastern Europe. Not a bad thing as we head into the Yom Kippur fast and the joyous Sukkot holiday. It's going to be a busy and short Friday, so we'll take this opportunity to wish all of our readers an easy fast and a G'mar Chatima Tovah. May we all be sealed in the Book of Life for a happy and healthy year. We'll be back on Sunday with more of our usual mix. Enjoy! Thank you for posting the video of the Yiddish Chefs. I have derived three significant benefits from that video that I would like to share with you. The first is that now I have another gluten-free replacement for kugel for Shabat and Yom Tovim. Yay! The second is a “eureka “moment. Ever since, I was a child, I always wondered why my mother’s cooked rice tasted like porridge, and was no pleasure to eat; while the rice at the local Chinese restaurant was granular, fluffy, and very tasty. I found my answer in Fanya Lewando’s recipe for Yom Tov Rice, featured in the aforementioned video. Her instructions were to cook 1 ½ cups white rice in 3 cups water. However, the instructions that accompany the rice cookers, sold on the market today, and used by most Asian families, ask for a proportion of 1 ½ cups white rice to 1 ½ cups water. Using less water prevents the rice from getting mushy. Finally, the mystery of the unpalatable, porridgey, Ashkenazi rice has been solved. The third pleasant surprise is the versatility of the recipe.While the Yiddish Chefs adapted it for Rosh Hashana by substituting honey for sugar, I have adapted it for Succott and Thanksgiving by substituting pure Maple Syrup for the honey. In addition, I found the quantity of almonds suggested in the video to be inadequate. [Perhaps the 6 chopped apricot pits called for in the original pre-war recipe contributed a more defined taste; however, substituting 6 chopped almonds, suggested by the Chefs, added nothing to the flavor or texture of the dish]. Consequently, I increased both the amount and kind of almonds used. Furthermore, instead of using an uncovered tureen-style baking dish, as portrayed in the video, I used a shallower, Pyrex glass baking dish. Finally, in deference to those that are concerned about the health risks of cooking with too much oil, the consensus around our dinner table was that the amount of oil suggested by Ms. Lewando was not unreasonable, but might be reduced without compromising the taste of dish. Cook rice according to rice cooker instructions or directions on rice package. Transfer rice-apple mixture into a greased, [sprayed] Pyrex glass baking dish, using a size 12 x 14 inch dish for a crisped-top version, or a size 8 x 8 inch dish for a fluffier consistency.